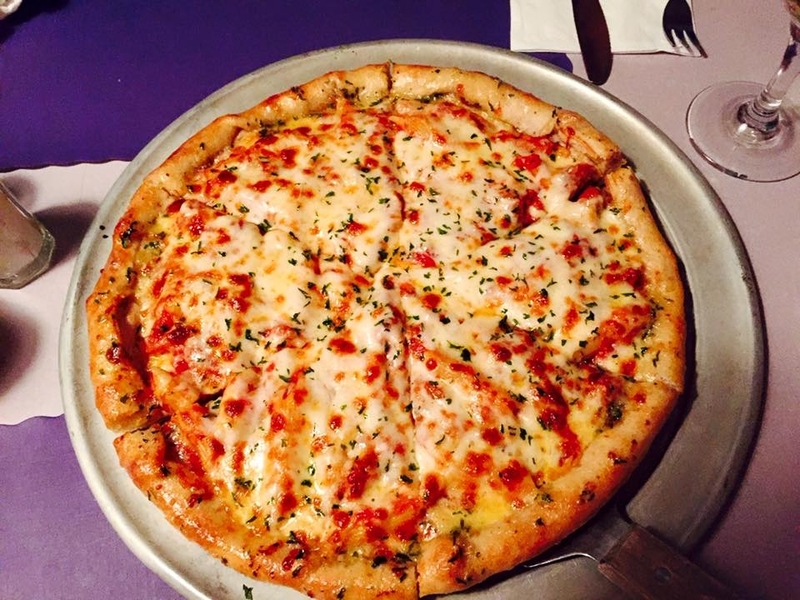 The Purple Pub is home to some of the most flavorful award winning pizza and wings that New York has to offer. We are celebrating our 46th year in business and we are a tasteful family restaurant with a tremendous atmosphere. Click "Join Us" in the Main Navigation for more info. An assortment of goodies, perfect for sharing, Breaded Mushrooms, Cauliflower, Zucchini Rounds and Onion Rings. Served with dipping sauces. Choice of Mushrooms, Zucchini or Cauliflower. Served with our homemade dipping sauce. Add 4 cheese blend and bacon for $1.50. Beer battered vine ripened jalapeno rings served with our homemade dipping sauce. 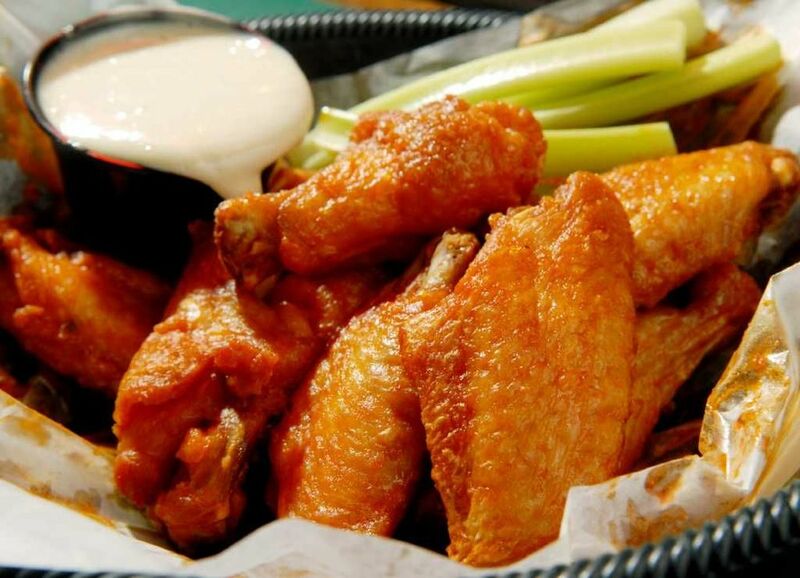 Generous mound of lightly dusted chicken breast strips tossed in your choice of wing sauce. Jalapeno peppers filled with cheddar cheese and fried. Served with tortilla chips, sour cream and cheese sauce on the side. 3 Jumbo Bavarian pretzel sticks topped with salt and served with cheese sauce and honey mustard. Sauteed peppers and onions layered with mozzarella cheese. Served with sour cream, salsa and homemade guacamole. Lightly breaded fried shrimp served with cocktail sauce. Dressings: Creamy Italian, Italian, French, Oil & Vinegar, Parmesan Peppercorn, Russian, Ranch, Low Cal. Zinfindale Vinaigrette, Honey Mustard, Caesar or Bleu Cheese. Blend of romaine lettuce and iceberg tossed with tomato, onion, cucumbers, peppers and carrots. Crisp romaine letuce with croutons, parmigiana cheese, eggs and Caesar dressing. Garden greens, salami, hot ham, provolone cheese, roasted red peppers, olives, onions, sweet cherry peppers and pepperoncini. Fresh crisp garden greens topped with ham, roast beef, turkety and American cheese. Topped with your favorite dressing. Fresh crisp romaine lettuce topped with scallions, black olives, rigatoni, roasted peppers, feta cheese and topped with Italian dressing. All are served with pickle & chips. Side orders are Available. 8oz. Angus burger topped with bacon, lettuce, tomato, and American cheese on a toasted brioche bun. Served with French Fries. Served on a hard roll with lettuce and mayonnaise. Turkey, swiss cheese and coleslaw on rye. Served with Russian dressing. Served with peppers and onions on a hard roll. Virginia Baked ham and swiss cheese on rye. Served with mustard. Corned beef, swiss and sauerkraut on rye. Served with Russian dressing or mustard. Corned Beef on rye with lettuce, tomato, Swiss cheese and Russian dressing. Tuna with American cheese, lettuce, and tomato on toast. Ham, American cheese, lettuce, and tomato on toast. Oven roasted thinly sliced beef with bacon, lettuce, and tomato on toast. Oven roasted turkey, bacon, lettuce, and tomato on toast. The classic, on white toast. Choose your cheese, American, Swiss, or Provolone. Fresh Haddock Filet served with chili sauce. American cheese, Hickory Bacon and tomato. Grilled half pound NY strip steak. Served on toast with lettuce, tomato and side of fries. Served with fries and cranberry sauce. Served with french fries and au jus. Over-stuffed. Also available as a sandwich. The best Italian sausage we could find. Also available as a sandwich. Sliced and served with mushrooms, onions and mozzarella cheese. Served with a house salad and your choice of potato, vegetable or pasta. With your choice of meatballs or sausage. Covered with mozzarella cheese and sauce. Six jumbo stuffed cheese ravioli's served with homemade spaghetti sauce. Ricotta cheese stuffed pasta shells bakes in spaghetti sauce. Fresh line caught haddock, broiled with butter and lemon or fried with choice of sauce. Fresh line caught haddock breaded and topped with homemade tomato sauce and cheese. Served with homemade tartar sauce. 10 oz. Swordfish steak served with butter and lemon. Fresh day boat scallops broiled with butter and lemon or fried with choice of sauce. Fresh day boat scallops breaded and topped with homemade tomato sauce and cheese. 10 oz. Charbroiled N.Y. Strip Steak. Served with dinner salad and choice of potatoes and vegetable or spaghetti. Honey dipped and served with dinner salad, cranberry sauce, potato and vegetable. Thinly sliced and served with dinner salad, potato and vegetable. Two half pound French cut pork chops. Served with diner salad, potato, vegetable and apple sauce. WANT TO PRINT OUR MENU? Covered with our homemade sauce and sprinkled with mozzarella cheese. Any of the following for $2.25 each for a large pizza and $1.25 for a small pizza. Try one of our mouth watering pizzas from classic to complex, we have it all! White pizza with tomato, crabmeat, scallops and shrimp. Red onions, mushrooms, green peppers, red peppers and broccoli. Chicken, cheese and red sauce. add .60 for each topping. Monterey Jack cheese, salsa, jalapeno peppers, black olives, seasoned beef and tomato slices. Sliced eggplant, cheese and red sauce.